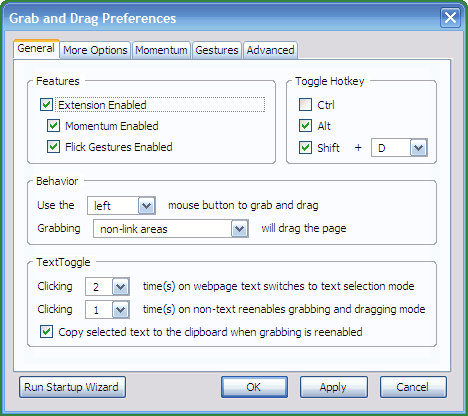 Grab and Drag is a Firefox add-on that provides several additional options to scroll pages on websites. The browser extension is only compatible with versions of Firefox released before Firefox 57. The usual way of scrolling websites is by using the scrollbar, the keyboard (Page-up, down, arrow keys, space) or mouse (mouse-wheel, buttons). If you are using a touch-screen, you may also use touch to scroll web pages. You may know one of the additional methods of scrolling that the extension introduces in Firefox from Adobe Acrobat. Users can simply click the mouse button in Adobe Acrobat to scroll the page up or down and that same functionality was implemented in the extension. Another option is the so called Flick-style scrolling which you can use to scroll in all four directions by quickly flicking the mouse in the direction that you want to scroll. Designed for pen or stylus use, it is working with a regular mouse as well. The extension displays a wizard on first start after installation that you can use to select your input method (3, 2 or 1 button mouse or pen-based computer). The main preferences of the extension are opened afterwards which you use to customize it to your liking. There you can for example enable or disable features. If you don't like the momentum feature for example, which speeds up scrolling based on the drag speed of the mouse or pen, then you can disable it there. Grab and Drag offers an incredible amount of configuration options. Some of the more interesting ones include a website blacklist to block its functionality on certain sites, to change hotkey modifiers, and to change the grabbing cursor so that it is easier to distinguish from the regular cursor in Firefox. Some features, like Flick Gestures, need to be enabled before they become available. Once you have enabled them in the preferences, you can customize them as well to your liking. In the case of Flick Gestures, you can define the scroll speed for example using a slider in the preferences. Grab and Drag works perfectly fine with touchscreen monitors as you can see in the above video.